Directly off the serger and not steamed or blocked in this pic, it's already closer to what I wanted. As I hinted might happen at the end of my last post, Steps for Sewing a Sweater, I took the plunge and redid the cuffs and bottom rib band of the Providence sweater. I know, I know the sweater was wearable, but these are new techniques for me, and I learn through practice and repetition. In the end the only thing I did differently when attaching the ribbing was to raise the differential feed to a 2. I tried stay stitching the main fabric before attaching the ribbing (again practicing on cutaways) and I couldn't see a difference, at least not on this fabric. I also gave top stitching a try, zigzaging (for stretch) with a 1 mm width and a 3.5 mm length. 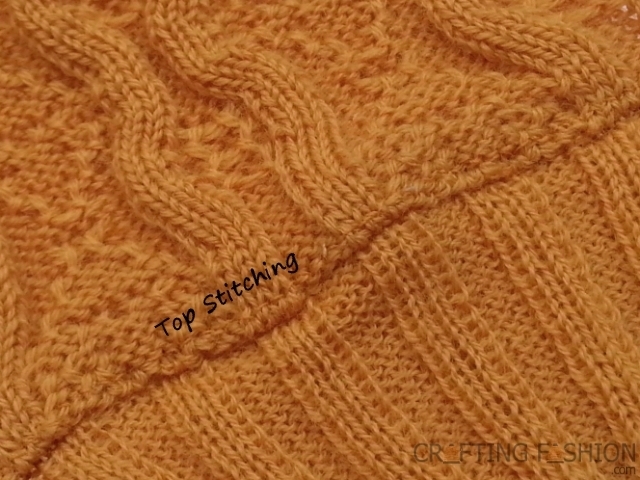 Look closely below the words "Top Stitching" to see it. I decided against it this time with no particular reason. I'll probably top stitch a future project. Sewing a sweater is nowhere near as difficult as I imagined. Being a first time owner of a serger, it took time for me to get my settings, but next time it will be so much easier. The cut and sew technique is very versatile. 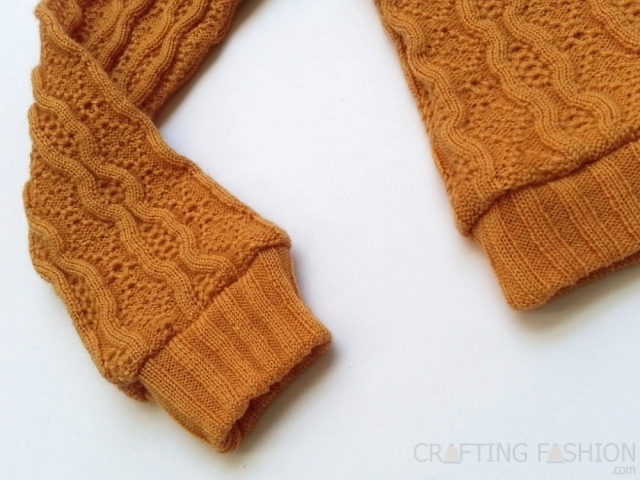 It was easy for me to change the ribbing -- I just cut off the old and attached the new. You can't really do that with fully fashioned. I drafted the sewing pattern for me, so I knew it would fit, but doing alterations on a too big project would not be a problem. You can't really do that with fully fashioned either. I love my machines! Ok, I knew that one already. From making my sweater knit fabric with a my knitting machine (Btw did you know some of my fabrics are now available in my shop?) to constructing the sweater with sewing machine and serger, machines are cool tools and I'm grateful to have them. If you can't tell that I'm excited about this project, let me just say that I AM!!! And I can't wait to start the next one! I love the pattern in the fabric and the colour. Looks like it turned out great. Your knitting machine sounds fun.